A jaffle is a toasted sandwich made in a device that seals the corners of the bread. They are equal parts delicious and dangerous, with the sealed edges trapping heat and steam inside the sandwich, often resulting in a burnt chin with the first bite. I used to love jaffles as a kid. But the varieties were pretty much limited to ham and cheese or tinned spaghetti (in a sandwich, I know, outrageous!). But now jaffles are taking a gourmet twist. There is a bar in Melbourne called Bad Frankie, which has an extensive collection of Australian spirits -liquid, not ghosts, as well as jaffles on the menu. They even have a dessert jaffle using lamingtons. Anyway, Bad Frankie is hosting a jaffle competition and whoever comes up with the best combination wins a bar tab, a jaffle iron and the glory of having their culinary creation on the menu. An excellent option for the vegetarian in your life. Like my sister. Anyway, Nick asked me to help rally some support for the Has Beans so I would really appreciate it if you could take time out of your busy schedule to click this link and click like on Nick’s jaffle. Nick has promised if he is in the top three to make me jaffles on demand for the rest of our natural lives*. And he clearly needs to win the jaffle iron in order to get the sealed edges on future sandwiches. So please, go ahead and click the link! I’ll be your best friend. In the meantime, do you love jaffles or toasted sandwiches? What’s the best filling? Have you ever entered a food competition? 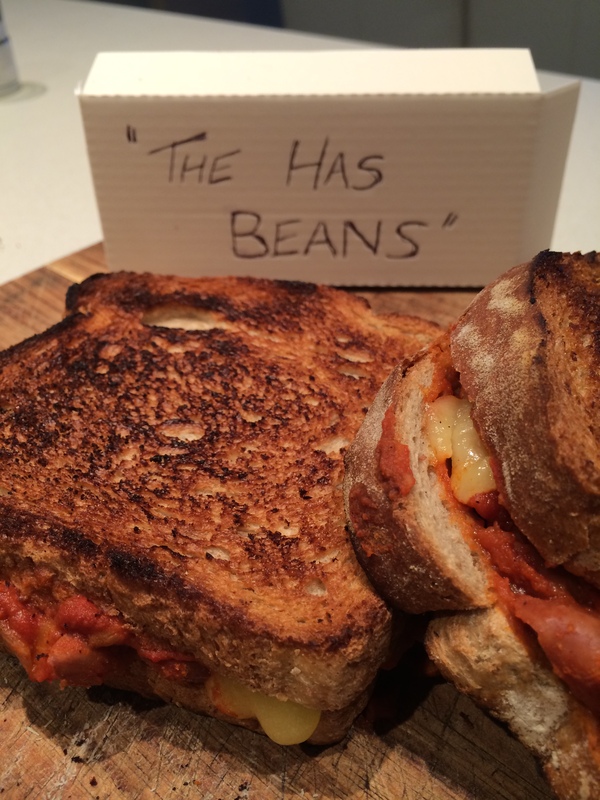 This entry was posted in Food and tagged Australian Food, Jaffles. Bookmark the permalink. Ohh jaffles… such a beautiful thing! We have a traditional Boxing Day jaffle of left over Christmas ham and cheese! I don’t feel like non-Australians get the big deal though! Good luck Nick!! Ohhhh god that sounds delicious! There’s nothing like eating leftover Christmas ham until February. Jaffles really are magnificent. I had a truffle Jaffle with truffle oil, gruyere cheese and grated truffle and that was pretty taste-bud exploding. I’ve been meaning to check out Bad Frankie! I love tinned spaghetti and cheese, avocado and cheese or grated carrot and cheese. I have to admit I prefer using the sandwich press, though. The filling is better distributed to the edges. Blue cheese anything is my favourite. The carrot and cheese does sound interesting! Will have to try it one day. I lie, I didnt realise you had to log into facebook, and I dont hae facebook! You don’t have Facebook? To quote Shoshanna from Girls: “You’re so f*cking classy”. But in all seriousness, I’m envious! I’m far too addicted. We had a Tiffany one as well! Classic.